If you just want to remove it you can accomplish that simply by changing the graphics to match the non blink tiles, no? What would you do with it other than blinking? Bass has that "gem" on his helmet which sometimes shines for a bit. The blinking can be used for that instead. Or maybe he wants to animate the mouth? I really don't wanna sign up at Twitter or Facebook or anything like that, since I really don't like those kinds of websites...do you know any alternate place, where I can contact DHI/DhiArk? Also, does DHI understand english? Because Google Translate is just LOL at translating, and I sadly don't speak japanese. Still have a problem with that. Also, in rock5easily's RockMan 2 Editor, there is a CHR button in the first and second category. What does that button do? Also, I still have no idea, why the scrolling screws up, if you die after reaching the first checkpoint but before reaching the second checkpoint. ...why do I not get any help at all? I could make Megaman yawn instead of blinking by just changing the tile it looks at, but I'm more interested in the rate at which it happens, and how to make the code affect other parts. I googled "twitter dhiark" I didn't need to sign up to see his twitter page. he has a link to his personal website on his twitter page. He has his email account on his webpage. 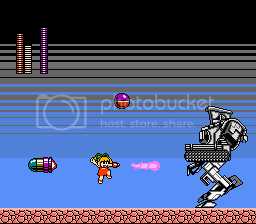 Thanks to Justin via Facebook, I found out that you are suppose to create mobile Roll by creating her body as sprite layer 2 which uses 3 colors. Then you insert Roll's red skirt, her red shoes, her green bow, and her hair as sprite layer 1. Look at my sprite sheet as I am going to begin working on it for Rockman 4 very soon. I still appreciate Zynk's Roll Chan which is much better than Yuifa's and Mega Man 9's Roll Chan actually uses 5 colors. Mobile Roll uses 9 colors as seen in my sprite sheet. According to Sprites-INC website, it claims that Roll's colors may not be accurate which I don't know what it means. The best method to insert pics into tile editors is to have the image sprites to have 4 colors but I rather draw them from scratch. Since this is NES, Roll's mouth should be the same color as her skirt. However, there is NO way to have her buster charge to be purple. You have the option to change whatever sprite layer you want. Now only one question is left...does he speak english? If not, is someone else, who can speak japanese, willing to send an e-mail to him with my question regarding his permission in japanese and then send me his answer in english? EDIT: Also, I'm still trying to change MagnetMan's AI a little. Kujakiller's document claim that his AI starts at the hex address C25E. However, I cannot find that address with the debugger of FCEUX, the only way to see 6502 in combination with hex. Also, I'm sure that ASM hacking would be a lot easier, if there would exist a way to visualize the code a lot better, so I know, what do what. That's also the reason why I could learn Game Maker so damn fast, because of basic variables, where you would immidiately know, what does what. I'm currently trying to figure out, what part of the MagnetMan AI code handles the X velocity of the part, where MagnetMan is floating in the air and shoots his Magnet Missiles. At least I know now for the most part, which hex value does what 6502 command. The feature of "Reload CHR" button is to redraw graphics with the ROM file reloading. Buttons in Both "Map" and "32x32 tile" tab are same function. Last view: 9 days Ah, okay. Thanks. It's also nice to see how the translation of your editor is evolving. BTW, I have sent a personal message to you. Last view: 717 days If you want to confirm MM5 sprite animations, my tool can be used. Last view: 9 days That looks damn handy. I will try it out, if I should start to hack RockMan 5. Last view: 74 days Some NES color samples to Roll Chan 4 project. (Rockman 4 hack) I need some suggestions before I start spriting after the Touhoumon video project. This is by default and is an example of an unlimited color samples to any video game and especially to Wii, Sega, Super Nintendo consoles, etc. Mega Man fangames are the same. As I already discussed about the green bow, here's the real result. This is what happens if Roll's green bow is used as sprite layer 1. Her weapon bar will be green and so is the weapon capsules. The only option is to change any sprite layer 1 sprites other than Roll to sprite layer 2 instead. This sample is originally going to be, Roll's Red Bow. But I also need to be aware of NES TILESET limits also so whatever tiles used to create Roll Chan mobile is going to be whatever is created. If you want to confirm MM5 sprite animations, my tool can be used. Last view: 5 hours @Insectduel: If you'll gonna use all 3 sprite palette sets, then you'll have to set the minor enemy sprites palette to the Robot Masters' sprite palette. But that'll take a lot of time assigning them. Optionally, if Roll's mouth will be always red-colored, then the 3rd palette should have red, green & other color. Anyways, I think Roll is still recognizable even with a red ribbon. I would like to see and play Mobile Roll on the NES either way, so don't overthink the green color. Last view: 717 days I made "sprite auto adjustment" patch for Rockman/Megaman5. This prevent sprite blinks by adjusting CHR-BANK assignment automatically. I made "sprite auto adjustment" patch for Rockman/Megaman5. thats interesting I always wondered why mm 5 was the only one of all 6 NES megaman's that did that had this weird sprite blinking/disappearing problem. None of the other games did that. Last view: 206 days Kuja, a stupid question from me... How can I "repoint" the Break Man fight to Needle Man's 1F room or anywhere else? Last view: 3 hours well did ya already first try out putting the sprite there ?? or do you mean the one about after the main 8 stages and 4 doc robot levels being finished ?? Yep, not the in-stage simple Proto Man fight, the one after the RMs and Docs. Which takes part in the room after Hard Man's boss room. theres a whole bunch more settings in this area like where to set megaman's telport down position, where to set protoman, his speeds, and so on. I was just giving the most "important" stuff here for the momment. Last view: 74 days @Zynk, I wasn't going to use sprite layer 3 in order to create her ribbon but that would be sweet if I walk around with random colors. And you're correct, Roll is still recognizable even with a red ribbon. Depends what tiles is used is the tiles is going to use and remember. Roll cannot slide since there is no sliding animation which gives me extra tile space. If I am out of tile space, then I have match the tiles. MySQL - queries: 116, rows: 157/0, time: 0.103 seconds.